Mount Polley mine site, September 5, 2014. 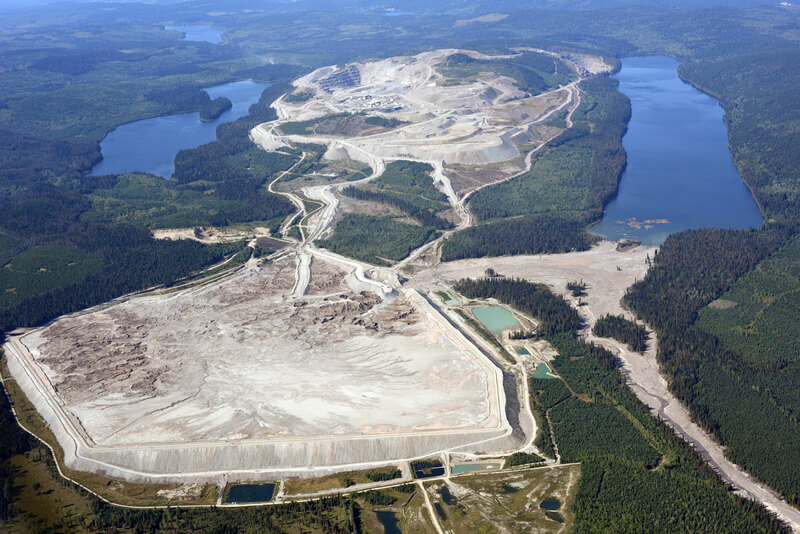 Imagery compliments of Jamie Heath, Terrasaurus Ltd.
On August 4th of this year, the tailings impoundment at the Mount Polley mine failed, releasing 25 million cubic metres of mine waste and construction material into the watersheds below. Some of the waste backed up into Polley Lake, most of it was dumped into the 10km Hazeltine Creek watershed, and some spread downstream into Quesnel Lake. Speculation about the cause of the breach includes accusations that the there was too much water in the impoundment and that the impoundment was not adequately buttressed as its height was increased to accommodate more waste. As we wait for the conclusion of the technical review and criminal investigations, information that has been revealed by various media investigations and disclosures by the BC government show that there were a number of warnings and red flags raised about the impoundment in recent years. Whether the issues identified in the past are directly related to the spill or not, the response of the BC government to the issues at Mount Polley tells us a lot about how the system of oversight of mining sites works in BC. The situation at Mount Polley is, unfortunately, typical of governments that want to maintain an “open for business” climate and seek to promote compliance with environmental and engineering standards but do little to force companies into concrete action in a timely way. Shortly after the spill, the CBC reported that the Ministry of the Environment had issued 5 warnings to the company for failing to report issues with the tailings impoundment and allowing the water level to go higher than was approved. These situations resulted in warnings and advisories but no charges and no public disclosure of the problems. When these issues were put to the Minister of Energy, Mines and Natural Gas, Bill Bennett on the CBC’s Power and Politics, he acknowledged that there was an advisory in May 2014 but denied the previous warnings that Imperial had been given. Former mine employee Gerald McBurney was widely cited in the media (e.g. Global News and DeSmog Blog) criticizing the mine’s management and stating that buttressing needed to stabilize the dam had not completed. Another former employee, Larry Chambers, has stated that he was fired after raising safety concerns with the BC Mines Inspector. Not reporting a “tension crack” in the tailings dam to the design engineers. Failing to deposit the tailings in such a way that would create a “tailings beach” around the perimeter as a buffer between the pooled water and the impoundment walls. Not conducting the weekly inspections of drainage systems in the impoundment as committed to in their own Operations, Maintenance and Surveillance Manual. 40% of peizometers (small wells used to measure water level and pressure in the impoundment) were not operational, despite advice from 2006 to ensure a full compliment of working equipment. After the 2010 report came to light Imperial issued a response noting that it had addressed many of these issues. What it doesn’t explain is why it operated in this way for a number of years prior to addressing them. In 2011, the same engineering firm that wrote the previously mentioned report wrote a letter to the company and the BC government stating that: “The embankments and the overall tailings impoundment are getting large and it is extremely important that they be monitored, constructed and operated properly to prevent problems in the future”. Despite the increase in the size of the impoundment --and this warning-- the facility was not inspected by BC in 2010 or 2011. The “soft on corporations” approach seen at Mount Polley is, unfortunately, not unique in BC. For years regulators have been aware of damaging selenium discharges at Teck’s Elk Valley coal operations. While management plans are discussed and measures to deal with the pollution are examined, the company continues to propose and receive permits to greatly expand its operations. Responses to the Mount Polley disaster from First Nations, NGOs, and the public have appropriately included calls for increased inspections and improved regulations. While these are certainly necessary, to be effective they must also be accompanied by a change in the culture of how our governments deal with compliance and enforcement issues. Greater whistle-blower protection is also critical. The Mount Polley case shows us that technical advice from engineers, operational commitments, and even warnings and advisories from regulators are not sufficient for companies to implement changes in a timely way. Corporations must face much stronger financial penalties, and we need governments that are willing to impose them and that recognise we cannot be “open for business” at any cost.